This breakfast casserole is easy to make and sure to be a crowd pleaser. With a Smart Points value of 3 per serving on the new Weight Watchers Freestyle program, it will get your day started right. The individual servings are easy to reheat in the microwave, so go ahead and make this in advance so you are prepped for the week. 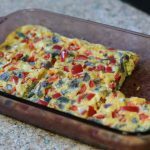 This yummy breakfast casserole is easy to whip up and lasts great in the fridge all week. Preheat oven to 375 degrees and coat lightly a 7 x 11 baking dish with cooking spray. Crack and whisk the eggs in a medium bowl. Add your bell pepper, onion, and cheese. Transfer egg mixture to your prepared baking dish and bake for 25 to 30 minutes or until the center of the casserole is set.